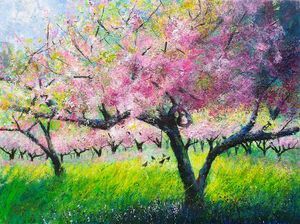 One of a series of orchard paintings depicting fruit trees in English orchards throughout the seasons. This is a spring painting with a group of chickens in the background. 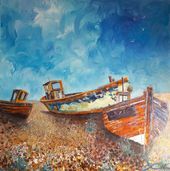 Impressionistic/semi-abstract with splashes of thickly applied textural paint in oil and acrylics. Sealed for durability. Canvas board ready for your own frame. After completing a Fine Art degree specializing in large scale monochrome and sculptural photography, I have over the years returned to smaller scale mixed media painting. Some of my works combine oil, acrylic, wax, ink and organic material found when out sketching. I am particularly interested in documenting through my paintings the fast disappearing old apple orchards and rich diversity of British woodlands together with the flora and fauna they support. Influences: Masahisa Fukase, Joan Eardley, Bruegel, Anselm Kiefer, Caspar Friedrich, Book of Hours. I currently teach groups of all abilities and ages in watercolour, acrylic, oil and mixed media.